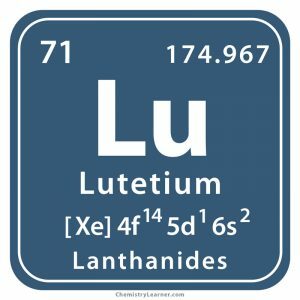 Lutetium (pronounced as loo-TEE-shee-em)  is a silvery, hard, dense rare earth metal classified as a lanthanide and represented by the chemical symbol Lu . 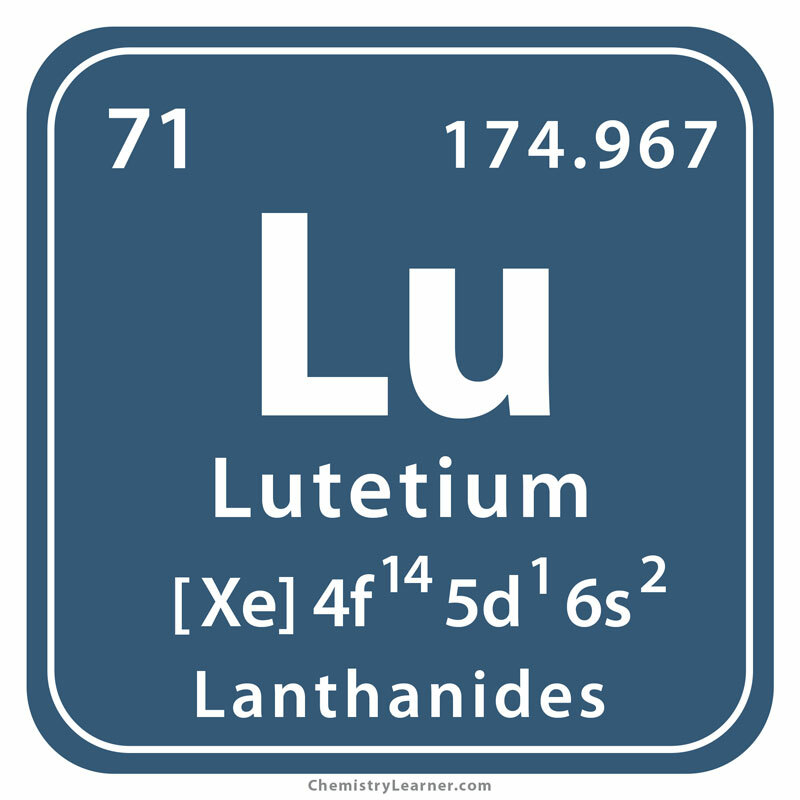 It is the last chemical element belonging to the lanthanide series , with the most naturally abundant, stable isotope being 175Lu (97.4% abundance). Another long-lived radioactive isotope 176Lu has a half-life period of 3.78 X 1010 years . Lutetium, in the same way as other lanthanides, is commercially obtained from the mineral monazite . Since it occurs in small amounts (about 0.003%) in monazite , its extraction can be difficult and is done by reduction of anhydrous fluoride using calcium metal . Although the element is found in trace amounts in almost all the minerals containing yttrium, they can be considered as natural sources of lutetium . The top 3 lutetium-producing countries are China, Russia, and Malaysia while the top 3 reserve-holding nations include China, CIS countries, and the USA . Origin of its Name: The element’s name is derived from the Roman word ‘Lutetia’, the ancient name for the French city of Paris . Who discovered it: Although the French chemist Georges Urbain, the American chemist Charles James, and the Austrian scientist Carl Auer von Welsbach independently discovered the element, the credit of discovery went to Urbain since he was the earliest to report the results . 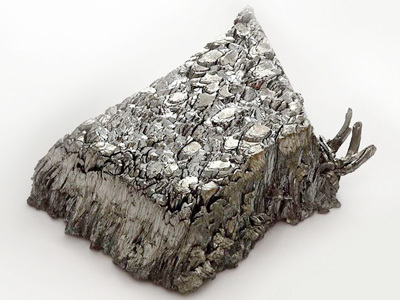 The mineral gadolinite or yttrium, discovered in 1794, has been the source of yttria, terbia, erbia, and other rare earth elements . The Swiss chemist Jean Charles Marignac separated erbia into two components including ytterbia and erbia, out of which ytterbia was believed to be a compound of ytterbium . In 1907, Georges Urbain while experimenting at the Sorbonne in Paris successfully isolated ytterbium into two elements, which he named lutecium and neoytterbium . However, these elements were later renamed lutetium and ytterbium respectively by chemists . Carl Auer von Welsbach separated the element from ytterbia and named it cassipoium after the circumpolar constellation Cassiopeia . Charles James also successfully extracted the element at the University of New Hampshire . Although it is difficult to prepare, the pure lutetium metal was produced in 1953 . It can be used as a catalyst for cracking petroleum products in oil refineries [1, 2]. Radioimmunotherapy with lutetium-177-dotatate is used as a form of cancer treatment while lutetium-176 is used for radiometric dating of meteorites . Lutetium oxyorthosilicate is used in PET (positron emission tomography) detectors for performing a medical scan to create a 3D image of the cellular activity in the body . 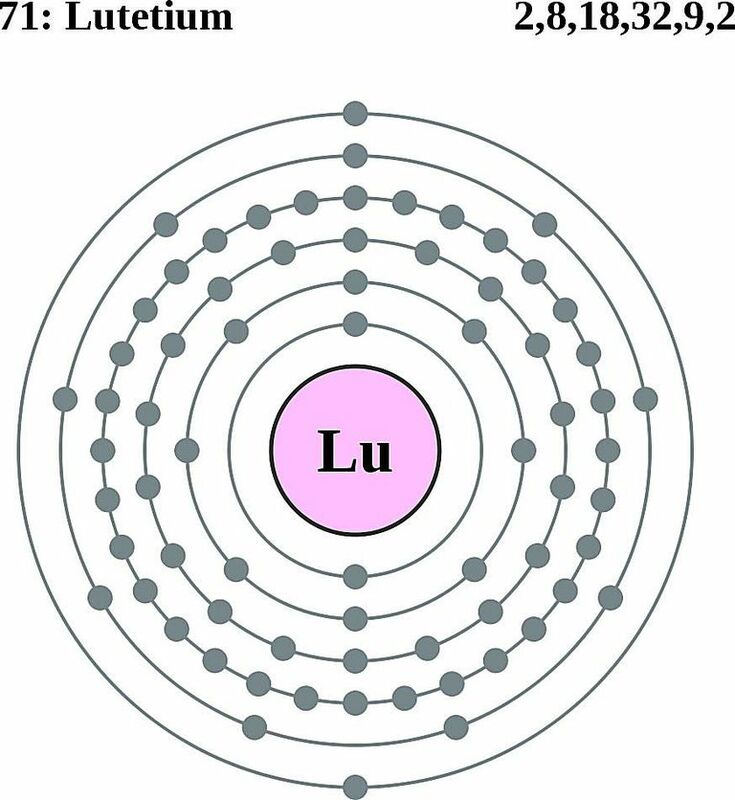 Lutetium has low toxicity and no known biological functions in the human body ; though it is thought to be able to help boost metabolism. It is also believed to be an explosion hazard . 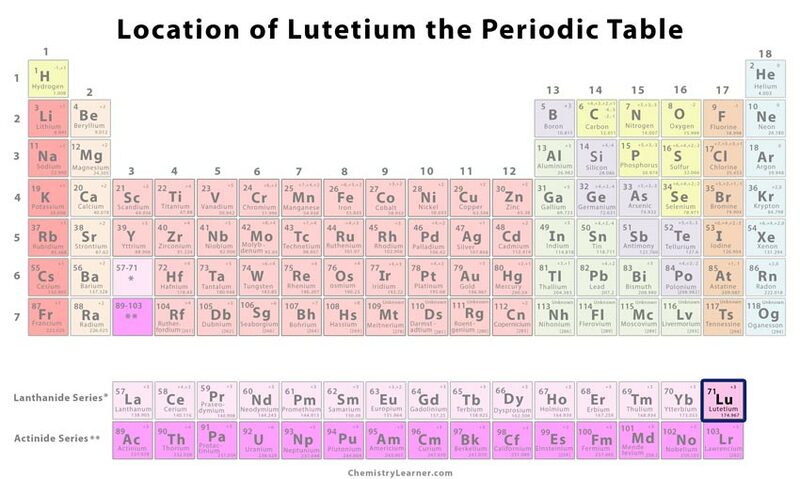 Lutetium is the hardest and the densest element in the Lanthanide group . It exists in compounds generally in its trivalent state, Lu3+ . The element is sometimes visually depicted by an image based on the coat of arms of Paris . 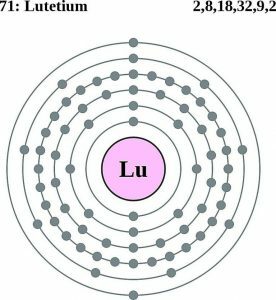 The pure form of lutetium costs about $350 per gram , but it costs around $7,000 per 100 gram in bulk .